Joint Ease with UC•II™ is exclusively formulated by Longstar HealthPro. and distributed by Farlong Pharmaceutical Inc. Recent studies show that a combination of patented UC•II™ (undenatured type II collagen from chicken cartilage using a patented low-temperature manufacturing technique) with glucosamine HCl and chondroitin sulfate work with the immune system to promote healthy joints, and improve mobility and flexibility. 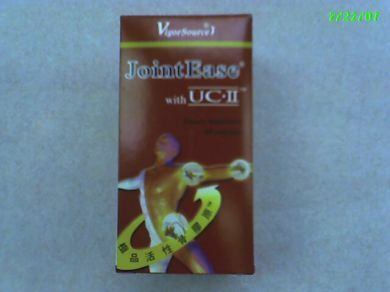 Joint Ease with UC•II™ contains pure glucosamine HCl, chondroitin sulfate, and patented UC•II™ brand undenatured type II collagen. Type II collagen is the primary structural protein of cartilage that provides flexibility and support to joints. Glucosamine HCl and chondroitin sulfate are well established nutrients in supporting joints and bone health.